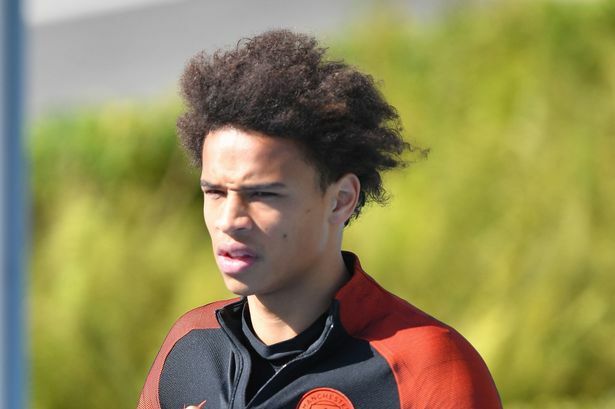 Leroy Sane could make his Manchester City debut in tomorrow night’s Champions League play-off against Steaua Bucharest. The 19-year-old Germany winger is touch and go to be ready for the second leg, after a hamstring injury saw him miss the start of the Blues’ season. The speed merchant has been in full training for a few days, and last week manager Pep Guardiola said that he would not be fit until after the international break. But after ruling out long-term injury victims Vincent Kompany and Ilkay Gundogan until next month, Guardiola said that Sane’s injury had only been minor and hinted that he might play. With City 5-0 up from the first leg in Romania, Guardiola promised there would be “some rotations” as he saves some of his big guns for Sunday’s Etihad crunch with West Ham. He has a number of young players in a 29-man training squad on the eve of the game, including keepers Angus Gunn and Billy O’Brien, defenders Pablo Maffeo, Tosin Adarabioyo, Cameron Humphreys and Angelino, and midfielders Bersant Celina and Sinan Bytyqi. The game would seem to be the ideal opportunity to blood some youngsters in Europe, but Guardiola refused to be complacent, saying that a bad start and a red card or two could easily throw the tie back into the melting pot. He also said that he has squad players – like Fernando, Fabian Delph, Jesus Navas, Kelechi Iheanacho and Nolito – who need minutes under their belts. “It’s difficult for me to leave out players who deserve to play,” he said. “We had tough games in the last week because Sunderland was a tough game until the last minute, then people think Steaua Bucharest was easy but it wasn’t because of the travel and everything. READ Sure 50 Odds Dropped- The Analysis Behind the Selections. “You know better than me what it means to go to Stoke City away and play there against them. “I will make some rotations, I don’t know how many. They deserve to play and I am so confident about all the players. “I have seen many times in the Champions League, at half-time an experienced team like AC Milan 3-0 ahead and the final is done. But Liverpool won the Champions League final. That Milan was Maldini, Cafu, more experienced guys. “We have a huge advantage. Our pre-season was focussed to prepare the team especially for this game. Who could Manchester United get in the Europa League group stage draw? Will you be sad to see Hart leave?